Martyn has 41 years of international shipping experience and has worked for shipowners, operators and shipbrokers in London, Johannesburg, New York and now Singapore. The companies he has worked for include Van Ommeren UK, Simpson Spence and Young Johannesburg, Clipper Bulk USA and HSBC London. Martyn is a member of the Baltic Exchange, having been first elected in 1979. 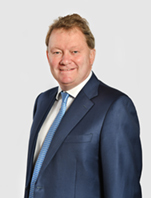 Martyn joined Grindrod Limited in 2008, was appointed Chief Executive Officer of the Grindrod Limited subsidiary Island View Shipping in 2010, and has been the Chief Executive Officer of Grindrod Limited's Shipping Division since his appointment in 2011. He was appointed to the Grindrod Limited board in 2011 as an executive director, and is a director of major international subsidiary companies of the parent company, the UK Freight Demurrage & Defense Association (UK) and a member of the advisory panel to the Singapore Maritime Foundation. He was selected to serve on the Board of Directors because of his extensive experience within the shipping industry, in-depth knowledge of shipping operations and ship management, as well as his leadership experience and strategic insights.